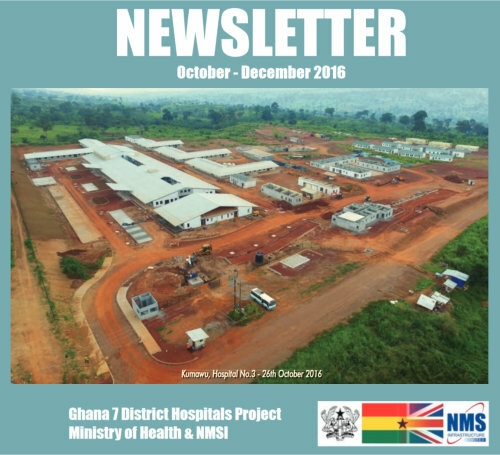 The new Shai Osudoku District hospital in Dodowa is flourishing! According to the new hospital management system, there have been almost 19000 visits, with over 1800 of those being admitted, while the maternity department has seen over 160 births. The walkways across the site have progressed well and are now waiting delivery of the roof sheets for completion, while the emergency generators and associated fuel tank have been installed. Terrezzo work surfaces and counters continue to be constructed within the residences and nursing stations, creating a superior finish to the kitchen areas of the residence and ward areas. External landscaping works have progressed well with grassed and planted areas across the majority of the site, as well as the commencement of maintenance.